People should not think they can get away with insulting the map of India or that there is no law. The Map of India is protected under the law of the land, as a national symbol. The protective cover may not be as visible as with other national symbols like the Flag or the National Anthem, but it is no less stronger. You are liable for criminal action in event the map is misrepresented, misused, or insulted in any manner. Presently there is draft bill pending in Parliament that proposes a punishment of upto 7 years imprisonment and a fine upto Rs. 100 cr. This is as serious as it can get! Until this law is approved by Parliament, do not think anyone can insult the map, and get away. 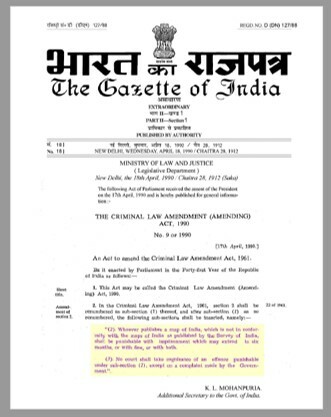 An amendment to the existing laws has provided for a punishment of 6 months imprisonment, at the minimum. Read the Gazette notification displayed here . The Survey of India office has a compliant cell and they aggressively follow up any compliant of such criminal activity. Once they take cognisance of the crime, you had better be prepared to face the nation and provide appropriate response to the SoI, IBD, Ministry of Home Affairs, and Min of Information Technology. One can also be sure to be trolled and insulted by the general public. Please do not try to go tell all and sundry that you are being insulted and defamed. You are the criminal and you have to make good your crime. You must read some documents which have been put out by the Survey of India on their website. It will be educative and good reading for anyone who wants to learn about the law and fair use of the map of India. Cyber Security practitioner and evangelist working in cyber security in national and enterprise application. Contributor to national policy, awareness and development of capacity / capability. Keeps a critical eye on the past, present and future in the infosec domain, and firm believer in common sense. Uses practical thinking to demolish purveyors of cyber hype and snake-oil.